The ring opening metathesis polymerisation (ROMP) is a popular chain growth polymerisation technique, which means that the polymer chain grows by adding one monomer unit at a time to the chain end. This is facilitated by a transition metal carbene complex; in our case, a commercial ruthenium complex invented by Grubbs et al. When well-defined polymers with narrow molecular weight distribution and molecular weight control are targeted, the reaction needs to be carried out under so-called living polymerisation conditions. This essentially means that each ruthenium carbene complex can only form one polymer chain and needs to remain attached to the polymer chain end for the duration of the chain growth reaction. This mechanistic requirement means that for the synthesis of short polymer chains, in particular, relatively high amounts of ruthenium carbene complexes are required, which increase the cost of synthesis, discolour the polymer and increase the levels of residual toxic metal in the final product. One of the polymer chemists’ tricks to overcome such problems for other polymerization techniques is using chain transfer agents (CTA) that allow a “degenerative chain transfer”. In our case, this allows us to use up to 50 times less of the ruthenium carbene complex than would classically be used. Of course, the ruthenium complex can no longer be forced to remain at the chain end of just one polymer chain. The CTA facilitates a constant equilibration of the polymer chain ends, thereby allowing the ruthenium carbene complex to “move from one chain end to another”, growing several polymer chains, one after the other, which macroscopically appears as if all chains were growing simultaneously (see Figure 1). Figure 1. Active (propagating, growing) polymer chains (shown in blue) exchange reversibly with dormant polymer chains (in red) via a degenerative chain transfer equilibrium. In our previous report, this exchange was very slow which lead to ill-defined polymers (top equilibrium shown). The current report uses a different chain transfer agent which results in a different end group of the dormant polymer chains (bottom equilibrium). These exchange ca. 300 time faster than reported before yielding well-controlled polymers. So why does it work this time? We show that the CTA used in the current paper reacts about 300 times faster with an active chain end than the one used in the retracted paper from 2015 (Figure 1). For the mechanism to work in a living fashion, a fast equilibration of the chain ends is absolutely essential. The “degenerative chain transfer” mechanism has been shown for several other polymerisation procedures in the past, most notably to gain control over highly reactive chain propagating species, such as radicals (called the RAFT = reversible addition fragmentation chain transfer polymerisation in this case). As the mechanism tolerates variations in the concentration of the active species (the ruthenium carbene chain ends, in our case), the initiation kinetics of the ruthenium carbene complex become less relevant to the final molecular weight dispersity of the polymer. 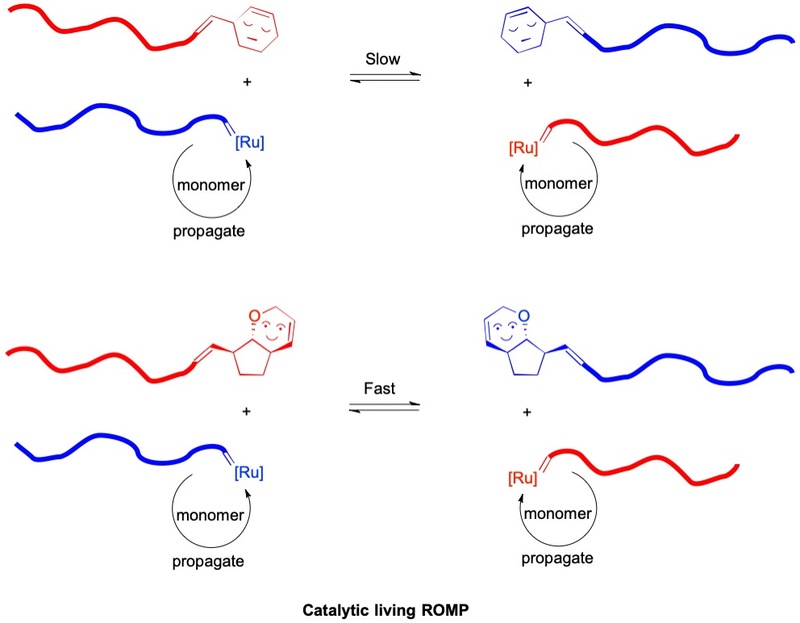 This allows us to use Grubbs’ 2nd generation ruthenium catalyst which, under classical stoichiometric conditions, would not be able to undergo controlled living polymerisations.